Product is one of the important elements of marketing mix. A marketer can satisfy consumer needs and wants through product. A product consists of both good and service. Decisions on all other elements of marketing mix depend on product. For example, price is set for the product; promotional efforts are directed to sell the product; and distribution network is prepared for the product. Product is in the center of marketing programme. Therefore, product has a major role in determining overall success of marketing efforts. A marketer tries to produce and sell such products that satisfy needs and wants of the target market. Other words used for product are good, commodity, service, article, or object. In marketing literature, product has comprehensive meaning. Term product has been variously defined by the experts in the field. 1. Product is one of the elements of marketing mix or programme. 2. Different people perceive it differently. Management, society, and consumers have different expectations. 3. Product includes both good and service. 4. Marketer can actualize its goals by producing, selling, improving, and modifying the product. 5. Product is a base for entire marketing programme. 6. In marketing terminology, product means a complete product that can be sold to consumers. That means branding, labeling, colour, services, etc., constitute the product. 7. Product includes total offers, including main qualities, features, and services. 8. It includes tangible and non-tangible features or benefits. 9. It is a vehicle or medium to offer benefits and satisfaction to consumers. 10. Important lies in services rendered by the product, and not ownership of product. People buy services, and not the physical object. A company sells different products (goods and services) to its target market. Consumer products are those items which are used by ultimate consumers or households and they can be used without further commercial and engineering processes. Such products improve or enhance users’ convenience. They are used in a day-to-day life. They are frequently required and can be easily purchased. For example, soaps, biscuits, toothpaste, razors and shaving creams, newspapers, etc. They are purchased spontaneously, without much consideration, from nearby shops or retail malls. These products require special time and shopping efforts. They are purchased purposefully from special shops or markets. Quality, price, brand, fashion, style, getup, colour, etc., are important criteria to be considered. They are to be chosen among various alternatives or varieties. Gold and jewelleries, footwear, clothes, and other durables (including refrigerator, television, wrist washes, etc.). Durable products can last for a longer period and can be repeatedly used by one or more persons. Television, computer, refrigerator, fans, electric irons, vehicles, etc., are examples of durable products. Brand, company image, price, qualities (including safety, ease, economy, convenience, durability, etc. ), features (including size, colour, shape, weight, etc. ), and after-sales services (including free installation, home delivery, repairing, guarantee and warrantee, etc.) are important aspects the customers consider while buying these products. As against durable products, the non-durable products have short life. They must be consumed within short time after they are manufactured. Fruits, vegetables, flowers, cheese, milk, and other provisions are non-durable in nature. They are used for once. They are also known as consumables. Mostly, many of them are non-branded. They are frequently purchased products and can be easily bought from nearby outlets. Freshness, packing, purity, and price are important criteria to purchase these products. Services are different than tangible objects. Intangibility, variability, inseparability, perishability, etc., are main features of services. Services make our life safe and comfortable. Trust, reliability, costs, regularity, and timing are important issues. The police, the post office, the hospital, the banks and insurance companies, the cinema, the utility services by local body, the transportation facilities, and other helpers (like barber, cobbler, doctor, mechanic, etc.,) can be included in services. All marketing fundamental are equally applicable to services. ‘Marketing of services’ is the emerging facet of modern marketing. Industrial products are used as the inputs by manufacturing firms for further processes on the products, or manufacturing other products. Some products are both industrial as well as consumer products. Machinery, components, certain chemicals, supplies and services, etc., are some industrial products. 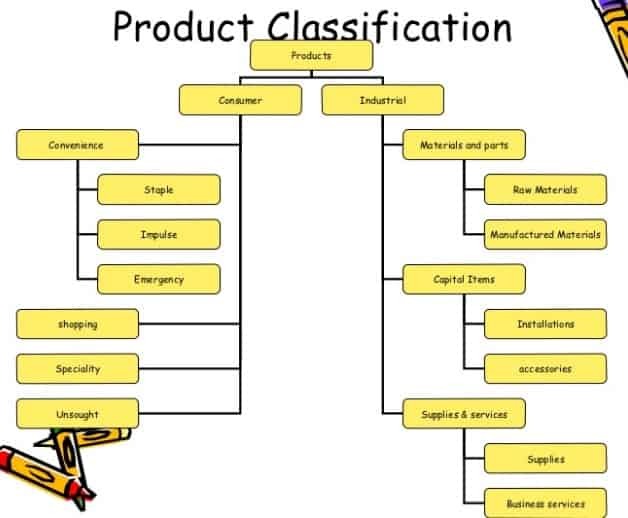 Again, strict classification in term of industrial consumer and consumer products is also not possible, For example, electricity, petroleum products, sugar, cloth, wheat, computer, vehicles, etc., are used by industry as the inputs while the same products are used by consumers for their daily use as well. Some companies, for example, electricity, cements, petrol and coals, etc., sell their products to industrial units as well as to consumers. As against consumer products, the marketing of industrial products differs in many ways. 4. Electricity and Fuels, etc. What is a work order – How it is prepared in different Manufacturing Methods?